You can configure majority vote check only for some tasks. It allows you to save money and speed up pool completion. You can reduce the check frequency as more tasks are completed by the performer. To do this, set intervals in the pool settings. Upload tasks to the pool using smart mixing. Switch to the pool editing mode. Under Tasks per page, click . 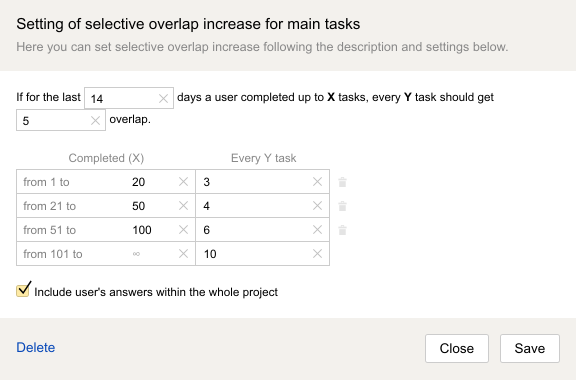 Specify how many days the calculation should take into account and the overlap for majority vote tasks. Set the intervals of completed tasks and the number of checking tasks for each interval.